Mango II is 3600 square feet. The floor plan of Mango II has six bedrooms, six bathrooms, living area, dining area, kitchen and two balconies. It's wide open, one-level floor plan was designed to accommodate large groups very comfortably. Five of the bedrooms have king size beds. The sixth bedroom is a large bunk room with two bunk beds with 4 full size mattresses. Each bedroom has its own private full bathroom and TV. Two of the king bedrooms have whirlpool tubs and share a private balcony. We can accommodate your infants with pack and play cribs if you will request it. Mango II occupies the top floor of Mango Mansion. Mango I (vrbo 7153) occupies the middle floor with an identical floor plan. The ground level is covered parking under the house. If your group size is up to 18 people, book either Mango I or Mango II. If your group is 19-36 people, book both units and enjoy the luxury of being all under the same roof in this magnificent house! Mango Mansion is located on the beach side of Hwy 30-A just about a mile to the east of Seaside village. The beach is about a 30 yard walk outside the back door via our private walkway. Mango Mansion has a private pool which only Mango I and Mango II share. A nineteen-mile paved bicycle/walking path crosses our driveway. Bike rentals are within walking distance. World class restaurants, shopping, fishing, golfing, tennis, state parks water recreation and more are within a short distance. Come enjoy the spectacular views of the gulf from your own balcony and partake of all the amenities the world's most beautiful beaches have to offer! Melanie Simmons Brown is the middle child of our five grown children and our only daughter. Melanie handles the multitudes of daily rental inquiries we receive for Mango Mansion while the rest of our immediate family tackles the other responsibilities of our beach house. 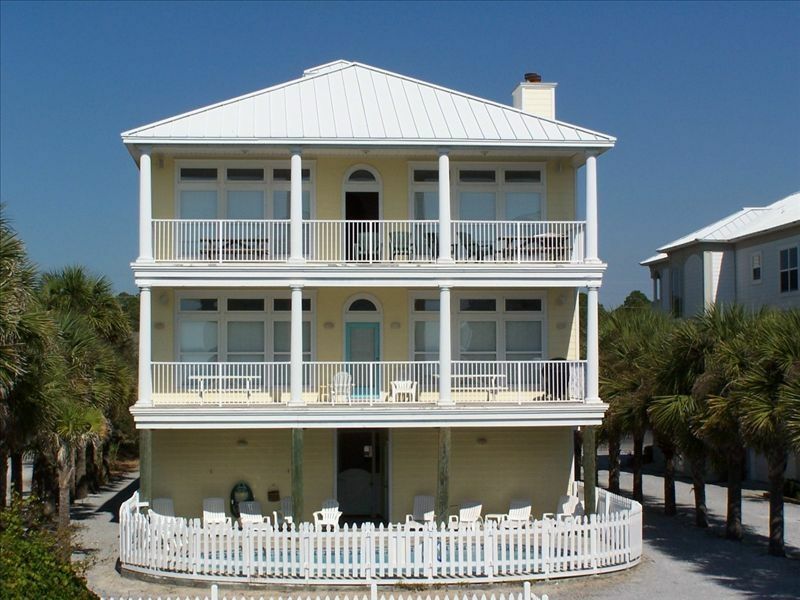 We are a large family that has enjoyed the gulf beach for over thirty five years. We love the beautiful water, the white beaches, the award-winning restaurants and the many activities available. We are excited about having Mango I and Mango II to share with other families who wish to experience the beach! Mango Mansion is truly our "home away from home" as we live only a little over an hour away in rural southeast Alabama. We are at Mango as often as our busy work and school schedules will allow us to do so. When we can't be there, we find it rewarding to know that our home is filled with family love and laughter. Our hope is for our guests to experience all the joy and fun we have when we gather at Mango with family and friends. Why did we choose 'Fullquiver' for our vacation rentals? From Psalm 127:3-5 we read that children are a gift from God and blessed is he whose quiver is full. As you can see from the photo, our quiver is very full! Together we are known as the "Fullquiver Gang": John and Karen Simmons, five grown children (John,David,Melanie,Paul and Mark), their wonderful spouses (Vivian,Stephanie,Seth and Kristina) and of course our absolutely adorable grandchildren!! The entire Seagrove Beach area is convenient to a wide variety of beach activities including shopping,dining, water activities and entertainment. In addition you can access a paved walking/bicycling path from our driveway that runs for miles east and west along Hwy 30-A. With a spacious living/dining area, there is room to accommodate everyone when we all wish to be together. On the other hand, we all have our own bedroom and bathroom when we wish to retire on our own. This is great! We have beach toys and pool toys located on site for use while at Mango. This is a huge help: no need to pack or buy toys. We also know that grocery shopping for a large family vacation can be a huge task. Therefore, we offer Mel's grocery service, you order the groceries online, we will pick up the groceries and deliver them straight to Mango and even ice the drinks and put the food items up for you. You simply check in and enjoy. Please let us know if you are interested in this service and we can check availability and pricing for you. We had a wonderful family Thanksgiving at Mango Mansion 2. We had 18 people and everyone was comfortable. Thank you for sharing your home with us. The Mango Mansion was great! The layout of the house is very accommodating and made it very easy to pick and assign bedrooms for the 6 families we had with us. Our favorite feature was all the pool/beach toys and beach chairs that were available already at the property. We didn't have to purchase any crab nets or sand castle building kits because they were all already there. We also packed our own beach chairs (Strapped to the roof of the van) because we didn't want to pay to rent them and ended up not even unpacking them. Overall everyone had a fun trip and we enjoyed the property. Best beach house for a large family! Our family rented Mango II for a New Year family holiday trip. Our group included five individual family units that totaled 10 adults, 7 children and 2 infants. This home is brilliantly designed for larger groups to be able to stay comfortably together in one beach house. We especially appreciated the wonderful dining space where our whole family could enjoy meals together and the six bedrooms all with private bathrooms. Since several of us were traveling with young children, we were thankful that the home included several family-friendly amenities like high chairs, plastic cups and bowls, and sand and beach toys. Truly, the owners of this wonderful home have left no detail unattended. The home had every thing we needed and more. Check-in and Check-out was a breeze. We highly recommend this property to anyone looking for a wonderfully relaxing family vacation destination! This is a perfect home away from home in Seagrove Beach. We had a family vacation that included 8 adults and 7 children, ages 9 - 17. The house has a wonderful layout for a large family, six bedrooms and 6 bathrooms which was perfect. The kitchen/family room area was very spacious with meal seating for all of us. The huge deck off this area overlooked the pool and the Gulf. Just a few steps down to the beach. There was also another deck/porch off the two master bedrooms and ample space for all the kids. This was our 9th year of using VRBO for our vacation rentals. Each year our family has grown...so we needed a very large home. This house was perfect, rented both floors, it is a very nice home, with over 10 kids we didn't feel uncomfortable with the décor (not overly decorated but just right)the parking was great, just a short walk down the private steps.. The owners were very accommodating, we had a lovely gift waiting for us when we arrived, truly a great house. Hope to stay here again next year! AMAZING! Beautiful House, BEST Owners! PERFECT! First, the house is stunning. It is so tastefully and beautifully decorated. The lay-out is fantastic! The views are breath-taking. The kitchen is spacious, bright, airy and and the most well appointed I've ever seen! We were 5 couples (30s) in the house and all had lovely & LARGE bedrooms, with King Beds and beautiful bathrooms! We didn't use the HUGE bunkroom but all left saying that Mango II would become a vacation spot again for us in the years to come, including once we start having families. The location is perfect and easy - walk to the beach or right across the street or down the road from some of Seaside's BEST restaurants. Truly minutes from the little downtown of Seaside. The main thing I wanted to boast about - how WONDERFUL the Simmons are!! They are so sweet and accomodating. And thoughtful in every sense of the word!! From the oh-so-thoughtful "welcome bag" to the extent of their care and responsiveness. Upon arrival I emailed them to let them know the blender wasn't working - no big deal for us but I didn't want to be held responsible for it. But I mentioned we didn't need it so not to worry about it. The Simmons DROVE FROM MONTGOMERY to bring us a new blender AND brought us a delicious chocolate cake! Totally unexpected (and even unnecessary) but so beyond thoughtful and sincere! Not to mention, they have the easiest, most hassle-free check-out of any place I have ever stayed!! I almost don't want to share this incredible find with anyone else because it truly is just that incredible. It is DEFINITELY a spot I will ALWAYS keep in mind for future vacations to Seaside and very likely will make it a point to come back to Seaside in the years to come just to stay at Mango II! It couldn't have been better! And such a wonderful, peaceful, perfect experience! THank you Simmons family! All linens provided EXCEPT for beach towels. Damage deposit is fully refundable. Additional deposit required for spring break.